After five long months, my friend, fellow broadcaster and activist, Hisham Al-Omeisy was finally released by his Houthi captors on Sunday 14 January 2018. Nothing can explain the emotion this image of Hisham, now a free man, with his sons evokes in those of us who have campaigned for his freedom every day since his kidnap (or as the Yemeni authorities would say ‘detainment’) on 14 August 2017. I had discovered Hisham whilst co-hosting a news and current affairs show on Talk Radio Europe with my friend, broadcaster Pippa Jones. We wanted the show to give time to the issues not being covered by the mainstream media and to have guests who had a fresh way of communicating. The human rights campaigner, Jamila Hanan, recommended I check out @omeisy Hisham’s twitter account and I was hooked. His description of it raining cats and dogs and his children singing the latest chart-topping hit whilst being driven to school was seductive and fresh. Hisham was an awesome guest whose human and communication skills reached way beyond the usual audience, and were quickly noted by other news networks. 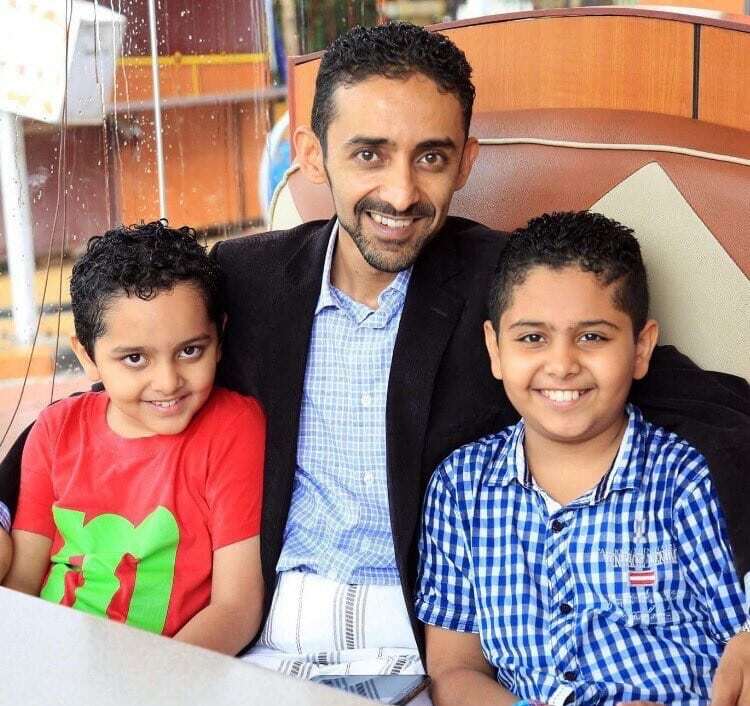 Within weeks, Hisham became the trusted voice of Yemen in the west, never afraid to speak out on war crimes committed by all sides in the Saudi Arabia proxy war; an openness that led to his detainment and the launch of a global campaign behind the hash tag #FreeHisham. Within two days, social media had come to his and Yemen’s aid. How could we save Yemen if the best voice telling us what was going on, was silenced? Many Yemeni activists had moved on to the Rohingya crisis and Yemen, the victim of arguably the greatest man- made humanitarian disaster since the second world war, limped on, almost friendless with a support network whose only aim and focus was #Freehisham. The first two months seemed positive, @Fidget02 set up a face book page; @Moyenne1, a Scandinavian supporter, started making short films to tweet and share; @Me_AYS would get up at 2am from his Indonesian bed to promote our global twitter storm #Freehisham #SaveYemen . Every Tuesday we would focus on a different area; one week lobbying British political leaders, the next USA leaders, both republican and democrat, securing the First United Position Vote in the House, supporting the call to stop USA involvement in the Yemen War. In the UK, SNP MP, Alison Thewliss, raised the campaign to #Freehisham in the House of Commons and The London Economic published my first of two articles on Yemen, quickly picked up by my friend at The Canary ,Steve Topple, the Independent and Guardian . The rest of the world’s media slowly started to pick up the story and, within days, we had boosted Hisham’s twitter account by 20,000 new followers, re-tweeting his tweets and making clear to his captors that keeping him locked up would only give him a greater and more powerful voice. 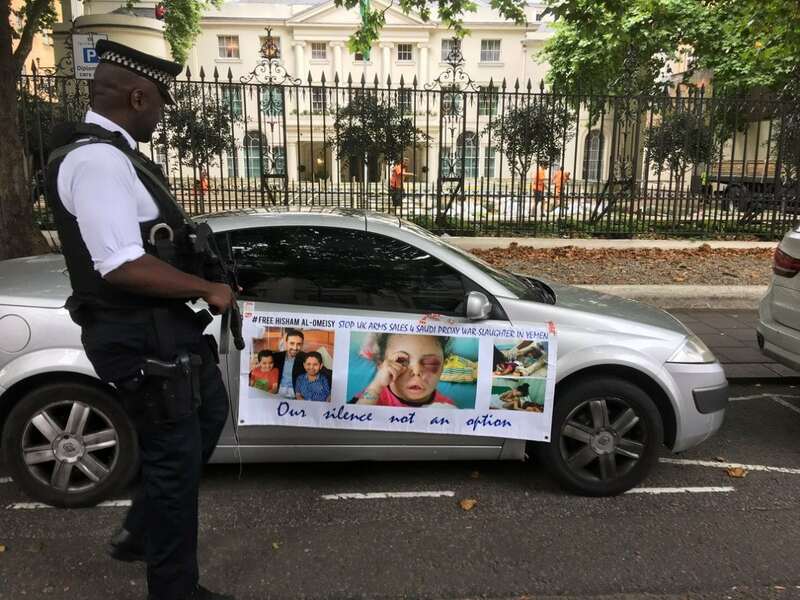 Thanks to social media, the Twitter storm and my published article, I was soon in direct contact with Hisham’s family and friends, many of whom were fearful that to speak out would put him in greater danger. This was a position I did not agree with and I found myself dealing directly through Twitter Direct Mail with his captor, Moh Al-Houthi, using the twitter translation service from Arabic to English and English to Arabic. Whilst some in our group wanted to go in for the full attack, I have had some experience of living in Egypt, and , therefore I have had some understanding of the mind- set and felt it vital to focus on Hisham’s importance to Yemen and his positive role in winning support for Yemen against the Saudi Arabia Proxy war. My viewpoint appeared to pay off; we communicated and I was led to believe freedom was days away. Across Yemen, many reported Hisham would be free, but then there was silence. From October to January not a word got out, no more contacts with the Houthi, but we continued to lobby Yemen political and army leaders, as well as those in Iran, as Iran seemed to hold the key. I made clear to Moh that if any harm came to Hisham, I would make it my duty to see him tried for war crimes in the Hague. And then, just last week, when those of us within the campaign began to think the worst, Hisham was freed. Yemen still has 39 unknown journalists detained; the war still rages,made possible by the arms sold by USA and UK movements who throw crumbs from the table in aid whilst lining their pockets with the billions of profits this miserable war generates. Turkey, Egypt , Iran ,Yemen are all countries which have far too many civil rights activists locked up, many without charge, some facing the death penalty. In 2018, the most feared weapon in the world is still the voice of people seeking social justice and civil rights. We activists fight many struggles; far too many we lose. But stories like the new hash tag, #FreedHisham makes our activism all the more important. Silence is never an option. Hope should never be abandoned when things look so bleak for, in the darkness, there are,thankfully, still many bright stars. Next PostIs it time to drop the B from LGBT?